How Does Latex Hybrid Mattress Affect Your Sleep and Health? The feeling of a good night’s sleep is incomparable. You get to wake up feeling revitalized, energized and ready to take on the day. Did you know that up until now you have probably spent over 25% of your life sleeping? This makes your bed one of the most important pieces of furniture in your household. However, it is your latex hybrid mattress that offers appropriate softness and flexibility to help keep your spine in its natural position. A good mattress goes a long way towards mitigating back pain and improving your general health. It improves your memory, helps you gain sharp focus, mental alertness, a healthy weight, curbs inflammation, spurs creativity, and improves productivity and athletic grades while adding years to your life. These are some of the reasons why you need to invest in a high-quality mattress. 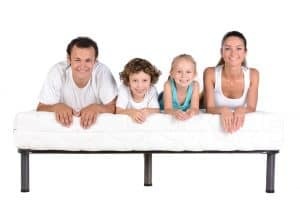 An old mattress accumulates dust, mites and other allergens over the years. This can cause a flare up of your allergies. If vacuuming your mattress and cleaning your bedding using hot water does not seem to do the trick, this is a clear indication that you need to invest in a new high-quality mattress. Comfort is key to a good night sleep. Studies show that people who get adequate sleep do better on tests and learn new things such as languages faster than those who don’t. This is because when you get restorative sleep, your brain gets time to practice the things that you learned throughout the day. Your spine works throughout the day to ensure your body is well coordinated. For this reason, it needs adequate rest to stay strong. Sleeping on an old mattress or one that is of poor quality puts your back at risk of muscle fatigue and other back problems. Sleeping on a good quality mattress allows your body to rest in its natural position, relax your muscles and ensures you get sufficient sleep that is refreshing. Lack of sleep has been associated with an increase in hunger and appetite, which eventually leads to obesity. Sleep loss stimulates the craving for high carbohydrate and high-fat foods. A good night’s sleep, on the other hand, can help you achieve your weight loss goals. A restless night leads to stressful days. If you sleep on a poor quality mattress, you probably wake up with aches and pains in your body. This is because the bed does not give your body sufficient support when you lie down to sleep. This, in turn, leads to stress related factors such as headaches and being in a bad mood throughout the day. There is no one-size-fits-all mattress. Different mattresses fit different body types and heights. Buying the wrong mattress can lead to physical pain. When purchasing your mattress, always ensure that it provides you with optimal comfort. A good quality mattress is key to living a healthy life. At Mattress Makers, we are all about restful and restorative sleep. Our decade long experience makes us masters of our craft. We pride ourselves on our high-quality mattress selection that includes latex hybrid mattress and natural hybrid mattresses that are organic and chemical-free and that fit a variety of budgets and preferences. Visit our store to explore our finest collection or contact us for more details.